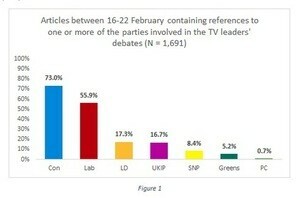 When broadcasters revised the format of the TV leaders’ debates to include not four but seven political parties, it was a reaction to the UK’s fast changing political landscape. The original line-up included the three established major parties – Conservative, Labour and Liberal Democrat – as well as UKIP after being elevated to “major party” status by broadcast regulators during the EU election campaign. But Prime Minister David Cameron was quick to challenge this composition, arguing that if UKIP should be included so should other minor parties, such as the Greens. Worried about the prospect of “empty chairing” the Prime Minster and being open to possible legal challenge, broadcasters soon responded by not only including the Greens, but the SNP and Plaid Cymru. The decision gave credence to predictions that the 2015 general election would see the end of the UK’s longstanding two-party system and witness a rise in the fortunes of the so-called minor parties. Since a hung parliament is predicted to be the most likely outcome, including the possible leaders of potential coalition-building parties in the high profile TV debates seems a sensible way of allowing voters to better understand the choices they face on election day. 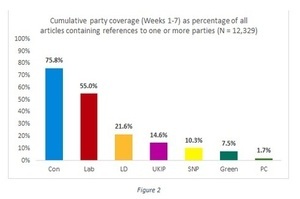 For the seven week period between January 5 and February 22, the balance of coverage between the seven parties was broadly similar to the seven-day period shown in Figure 1. 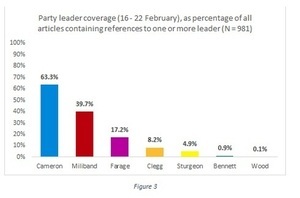 Once again, the Conservatives dominated, appearing in over three-quarters of articles (75.8%) featuring any party, while references to the Labour Party made up over half of coverage (55%). 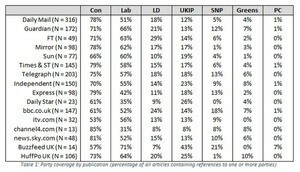 The Lib Dems featured in just over one-fifth of news (21.6%), and the UKIP figures show that Week 7 was a good one for them – on average, they appeared in just 14.6% of articles in Weeks 1-7. While the aggregate figures for the three minor parties – theSNP, Greens and Plaid Cymru – were slightly better than in Week 7, they still appeared far less than the two major parties. In this respect, according to both the Media Standards Trust’s snapshot weekly picture of coverage as well as the cumulative seven week analysis, the opportunities for the minor parties to pitch their polices and layout their vision for the future appear limited. While the latecomers to the TV debates – the SNP, Plaid and Greens – can use this platform to even up the contest, in day-to-day coverage they are currently being squeezed out of the campaign on the most popular UK online news sites. Far from the 2015 general campaign turning into a seven-horse race, the longstanding two-party dominance of Conservative and Labour remains firmly intact.